Y FIRST recommendation is: Sing the Propers of the Mass. The Roman Rite of Mass is very ancient, even more ancient in its roots than the various Byzantine liturgies, and it always maintained a fundamental structure and integrity that has never wavered―until the 1970s and after. This beautiful structure is articulated most basically by two elements: the Ordinary of the Mass (Kyrie, Gloria, Credo, Sanctus, Agnus Dei) and the “Propers” or antiphons proper to the day (Introit, Gradual, Alleluia, Offertory, and Communion). Since nowadays the Gradual is often replaced by the Responsorial Psalm and the Alleluia by the Gospel Acclamation, let us focus our attention on the other three, the Introit (or Entrance antiphon), the Offertory antiphon, and the Communion antiphon. Now, it is certainly not possible in most cases to go from never using the Propers to using all of them in their full Gregorian versions―even though these versions are of tremendous beauty, and were expressly recommended by Vatican II. But what we can and must do is begin to chant the Propers in some simple way, so that they reclaim their important liturgical, devotional, and pedagogical role. They structure liturgical time and space in important ways; they nourish our devotion as they accompany the different actions of the Mass; they instruct the faithful by placing the Word of God in their ears, in their hearts, even on their lips.So, the #1 improvement is to choose a reliable book of Propers and simply begin to use them―and, at least initially, alongside whatever music is customarily used at those times. For example, have a cantor or the choir sing the Introit right before Mass begins, and then everyone sings the Entrance hymn; or one can start with an Entrance hymn and then, when the priest reaches the altar and incenses it, the cantor or choir sings the Introit. The same practice can be followed at the Offertory and at Communion time. This, all by itself, can have an amazing effect on the way the liturgy is perceived and experienced by the congregation. It begins to be perceived as the work of God, not the work of man; as a formal offering permeated with the Word of God. 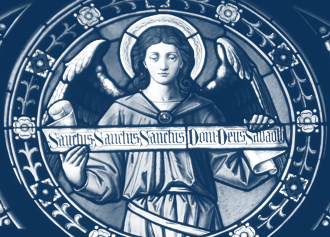 There are plenty of good options now for singing the Propers in English: the Simple English Propers, Lumen Christi Missal, or Lumen Christi Simple Gradual by Adam Bartlett; the Lalemant Mass Propers by Jeff Ostrowski; the forthcoming Proper of the Mass by Fr. Samuel F. Weber, OSB. Moreover, the Responsorial Psalm and Gospel Acclamation can be reclaimed for Catholic tradition simply by singing them in a chant style; and again, one need only visit the Chabanel Psalms or Illuminare Publications, among others, to get the right music. Without displacing a community’s hymns, without dropping the Latin bomb, without disrupting the flow of the liturgy, one can reintroduce the Propers of the Mass and, in this way, begin to reconnect the liturgy with its rich musical and textual heritage. This will be beneficial to the spiritual lives of Catholics, who are supposed to be steeped in the authentic liturgy of the Church. Y SECOND RECOMMENDATION is: sing the Ordinary. When traveling, one frequently encounters two sorts of parishes: (1) the parish that never sings the Ordinary of the Mass, and (2) the parish that does sing it but with tunes and rhythms that are hardly worthy of the exalted words being sung or of their role in the unfolding liturgical action. The solution here, as above, is to “launch out into the deep” by starting to build up a repertoire of simple vernacular plainchant. Week by week, month by month, season by season, sing “Lord, have mercy” or “Glory to God,” sing “Holy, holy, holy” or “Lamb of God,” and yes, sing the Creed too!―but use beautiful chant settings that bring out the words as prayers rising up to God like clouds of incense, as expressions of sacred mysteries that we are unworthy to utter with our lips, as glimpses into the Heavenly Jerusalem. That is what the chant style of singing accomplishes, in its simple, humble, modest, and yet exultant way. Again, as with the Propers, this is not too difficult for an average community. What is required is a lot of repetition: start with one Mass setting and use it a lot, so that it becomes second nature; and if another setting will be learned, take advantage of a seasonal transition (e.g., the start of Advent or Lent or Eastertide). Once again, resources are abundant. Every hymnal I’ve seen contains the ICEL Mass setting, but, in my opinion, there are many other chant Masses that are better―for instance, the ones found in the Lumen Christi Missal and Simple Gradual, various Mass settings by Jeff Ostrowski, two Masses by Aristotle Esguerra that were included in the Vatican II Hymnal, and settings available at the Church Music Association of America’s website, MusicaSacra.com. To start singing the Propers of the Mass and the Ordinary of the Mass in English chant―even if one needs to take baby steps, starting with one of the antiphons or one particular part of the Ordinary―is already to take a tremendous step forward in the realization of the ideals of the Liturgical Movement, the Second Vatican Council, and both John Paul II and Benedict XVI.